Web site: www.annazygmunt.jimdo.com Anna Zygmunt Born in Sosnowiec 1976, Poland My artistic career has begun at the National School of Fine Arts in Katowice, Poland where I obtained qualifications in Sculpture (1991-1996). I studied painting, drawing, sculpture, lettering and calligraphy, designing, history of art and history of philosophy among other art related subjects. In years 1996-2002 I studied linguistics at Silesian University, English Philology Department (MA). In my artistic career my primary choice are oil paintings which are born when my mind crosses the thin line between consciousness and sub-consciousness. Artistic work needs the exploration and combination of the past and present by means of new forms of expression based on inner spiritual values. Last year I have concentrated on the subject of a woman. A woman, which for me, is a combination of extreme emotions; ethereal beauty but at the same time strong values. It is the subject which may serve a lifelong inspiration and as the art history shows it has always been a big challenge to artists. 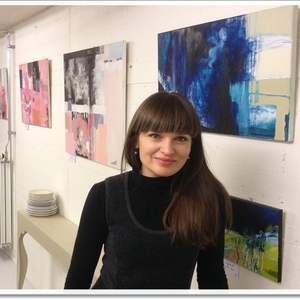 It's possible find her paintings by art collectors in Poland, Italy, Netherlands, Romania, Canada, Australia, United States, Saudi Emirates, Montecarlo, Germany, Austria, France and Belgium. Silesian University, English Philology Department (MA).